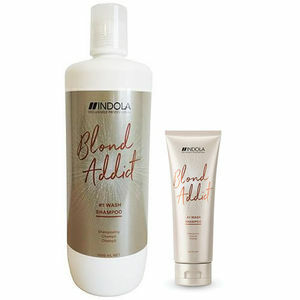 Indola Blond Addict Shampoo is specifically to wash and build bonds in all types of blonde or highlighted hair. Its formula, containing hydrolyzed keratin, uses integrated hair-bond technology that goes beyond fibre regeneration to reconstruct damage, strengthen each strand and reinforce and protect against future damage. It's step #1 (Wash) in the Indola Blond Addict hair care programme. Available in a 250-ml tube or a backwash-sized 1000-ml bottle (pump sold separately). £5.88 (inc. VAT) Why no VAT? We're a trade wholesaler and quote our prices without VAT to help our VAT-registered customers understand the true cost of a purchase. Shimmer spray that neutralizes yellow and brassy tones while adding smoothness to hair. Conditioning treatment especially designed to reduce breakage and restore bounce and shine to blonde hair. Available in 200 ml or 750 ml.